Nature has designed a wonderful supporting system for the tooth. 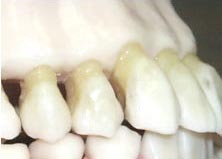 The tooth is suspended in the jawbone by a very thin; fine but strong system of ligaments. 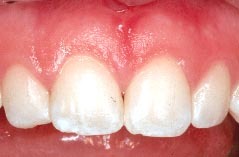 The gingival (gum) tissue covers the bone. In a healthy mouth, around the neck of each tooth, the gum attaches, to form a tight cuff and seal with a 2 to 3 mm deep crevice or sulcus surrounding the tooth. The seal is a fantastic barrier to the mouth bacteria and irritants.